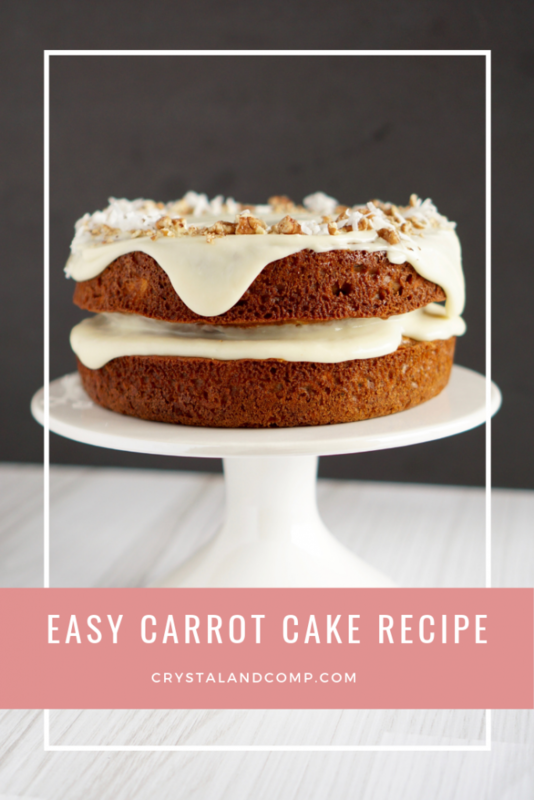 If you are looking for a simple carrot cake recipe, I have you covered! It is so much easier to make than you might think. 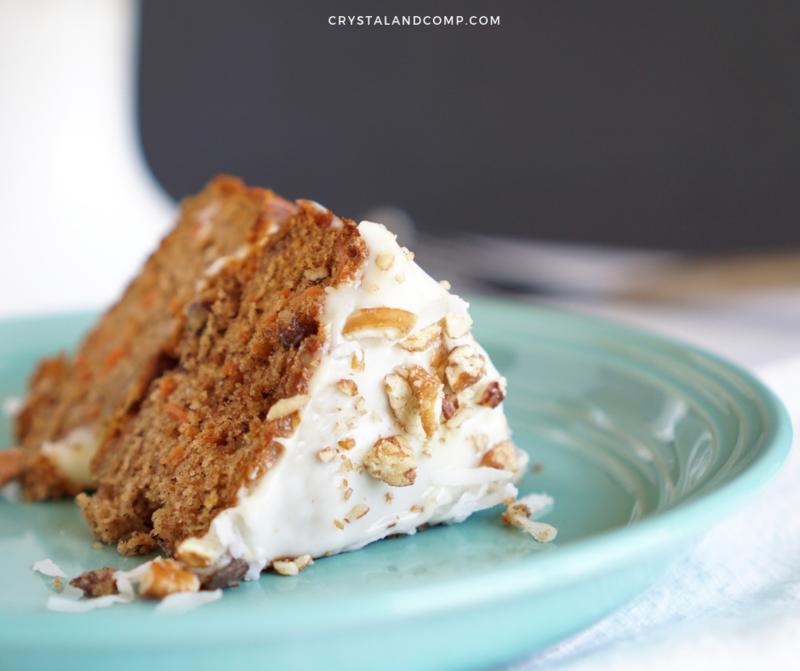 I am also going to share with you the perfect (and simplest) carrot cake icing. You’re going to love it. I especially like that this is a round layered cake. 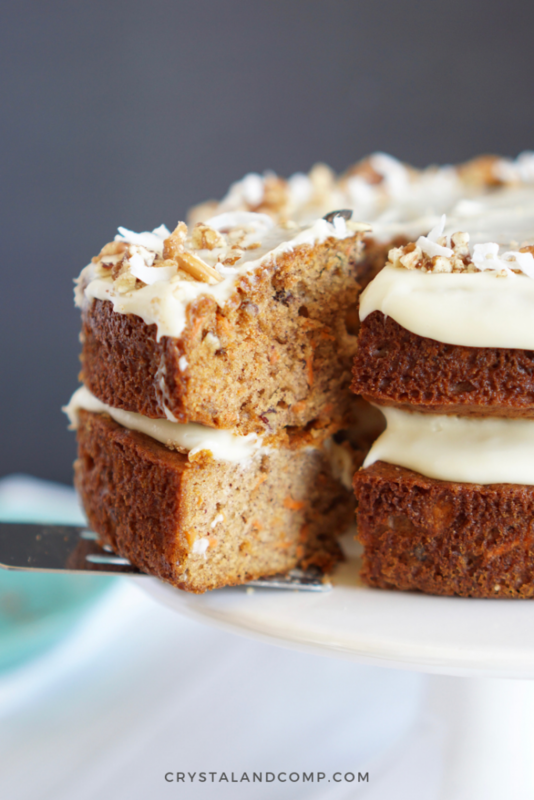 If you are on the hunt for more cake recipes, we have tons of them to share! Let me show you how easy this one is to make. First, let’s gather up your ingredients. Here is what you will need. The five eggs are part of what make carrot cake so dense. You are going to love how these flavors all come together. If you want, you can swap out the chopped pecans for chopped walnuts. Either one is super yummy! Heat up the honey in microwave for 30 seconds. This will allow it to blend well. Then let it cook so it does not cook the eggs when you mix it together. In a medium bowl cream together the eggs, oil, and honey. In a separate bowl, combine your flour, salt, baking soda, and cinnamon. Slowly, add the wet ingredients to your dry ingredients using a hand mixer or your standing mixer. Add about 1/4th of the wet mixture at a time, mixing well before adding then next 1/4th. Ensure everything combines well. Add in the grated carrots and mix well. Now it’s time to fold in the pecans (or walnuts if that is what you decided to use). Now, let’s add it to the cake pans by dividing the batter in two 8” cake pans that you have greased and floured. Bake for 25-30 minutes or until a toothpick comes out clean when inserted in the center. Once they are done, remove cakes from oven and let cool completely on a wire rack. While the cake is cooking, let’s make the icing. In a medium bowl or your standing mixer, combine the cream cheese and butter. Mix until well combine. Now let’s add in the honey and vanilla. Mix to combine well. Now let’s add in the powdered sugar to thicken the icing up. Once the cake layers are cool grab a cake plate or cake stand. Place one of the 8” cakes and add a layer of icing. 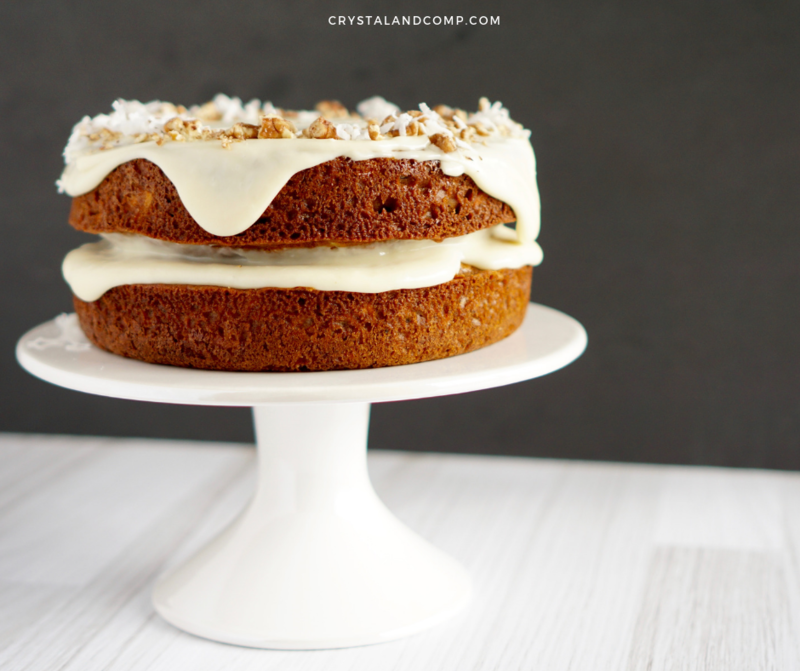 Add enough icing that some naturally pours over the sides of the cake without making a mess. It should be thick. Add the second cake layer on top and spread icing evenly allowing some of the icing to drip down the side of the cake. 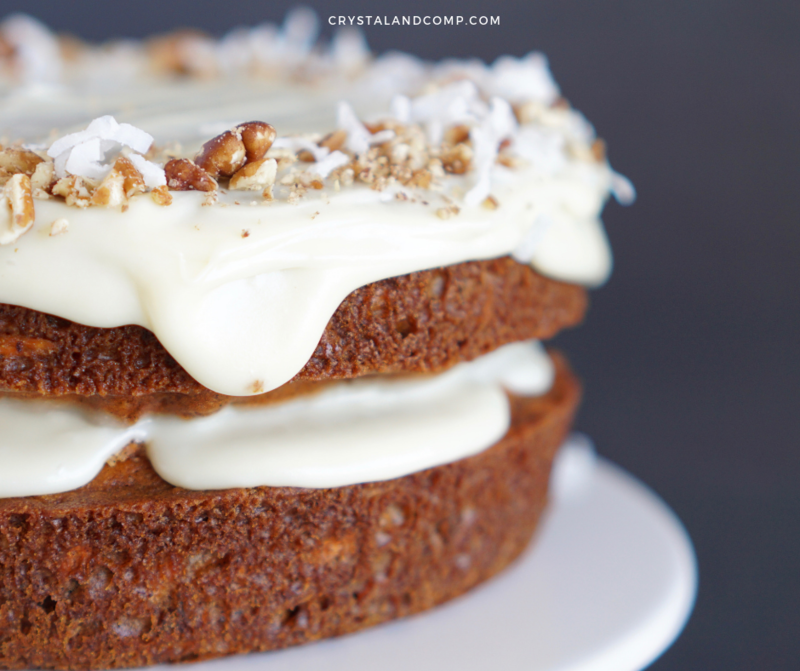 We garnished the cake with chopped pecans and coconut flakes only around the side. Slice, serve, and eat every last bite! 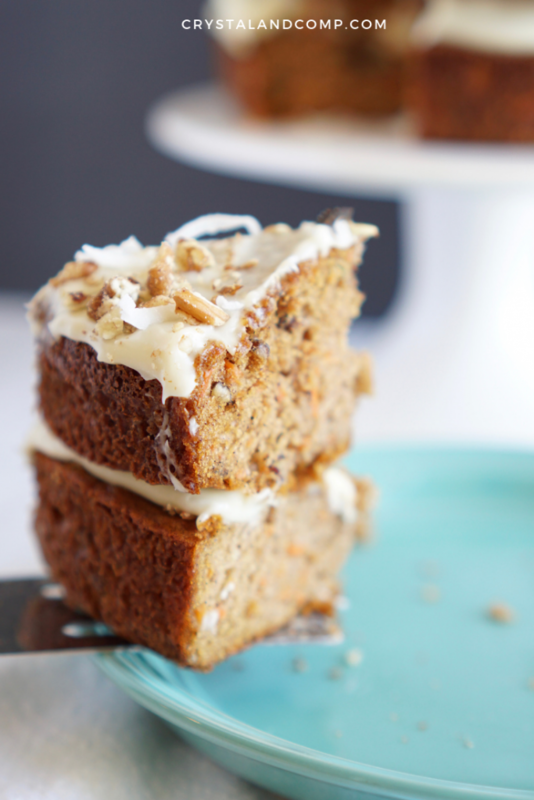 Sometimes our carrot cakes will sink in the middle and this can be so frustrating. There are a couple of reasons this happens. Either you did not let the cake finish cooking- it needed more cook time. Or, you kept opening the oven door while it was cooking. This can be especially damaging to a cake if it has not set you. Each time you open the over door the cake looses heat and more cook time is added. You added too much or not enough of one of the ingredients that causes the cake to rise (baking soda). Pay close attention and ensure you’re added the right amount of each ingredient. You can keep this in the fridge, preferable in an air tight container, for up to a week. After that, feel free to freeze it. You certainly can freeze your leftovers of the cake or freeze the entire cake. Cover it in clear wrap and then in foil. It should keep well in your freezer for up to six months. When you’re ready to defrost it you can either let it sit on the counter for 2-3 hours to let it defrost or stick it in the fridge to defrost overnight. You can even refreeze it again as long as it’s not old and molding. 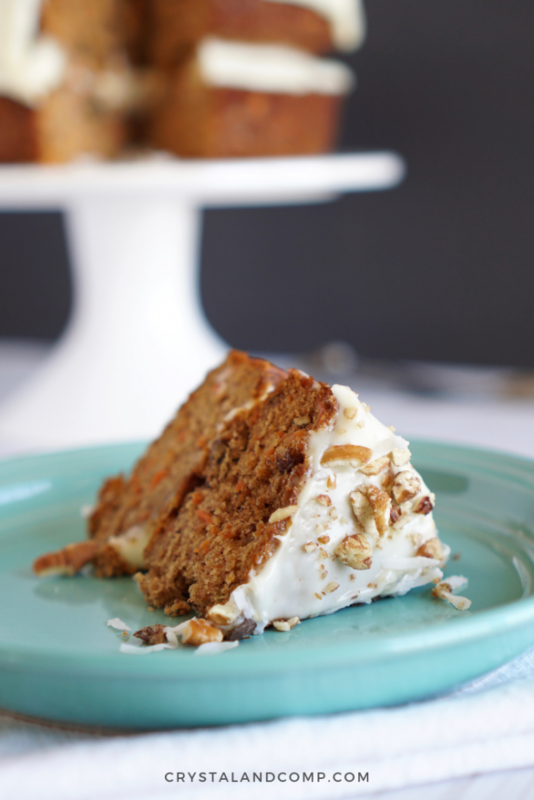 You can use this same recipe to make carrot cake cupcakes instead. Use a traditional sized muffin tin pan and cupcake liners. Bake them for at 350 degrees for about 12-13 minutes or until a toothpick comes out clean when inserted.